Atapuerca: A World Heritage Site - In a small hill east of Burgos, Spain, evidence of the presence and lifeways of prehistoric humanity is preserved, spanning the time from one million years ago to the present. Throughout the centuries, many different human groups have lived and left their marks on the Sierra de Atapuerca, which at different times in its history has been a refuge, hunting ground, sanctuary, battleground, landmark, limestone quarry and, finally, archaeological site. Artefacts Canada: Natural Sciences - A database of approximately 1 million specimen records representing more than 28,000 different species based on the collections information provided by contributing museums. Images are displayed when available. Find treasures from circleiplines including Botany, Earth Sciences, Herpetology, Ichthyology, Invertebrate Zoology, Mammalogy, Ornithology, and Palaeontology. Dinobase - Dinosaur pictures, genera/species list, taxonomy, and research. Dinofish - The fabulous Coelacanth ("see-la-kanth"), that 400 million year old "living fossil," swims on. Once thought to have gone extinct with the dinosaurs, the Coelacanth was circleovered alive and well in 1938. This is the web site of the Coelacanth Rescue Mission, a project under the direction of Jerome F. Hamlin to reduce Coelacanth fatalities. Evolutionary Anthropology - Focuses on issues of current interest in biological anthropology, paleoanthropology, archaeology, functional morphology, social biology, and bone biology-including dentition and osteology-as well as human biology, genetics, and ecology. Guide to the Orders of Trilobites - Trilobites are hard-shelled, segmented creatures that existed over 300 million years ago in the Earth's ancient seas. They went extinct before dinosaurs even existed, and are one of the key signature creatures of the Paleozoic Era, the first era to exhibit a proliferation of the complex life-forms that established the foundation of life as it is today. Although dinosaurs are the most well-known fossil life forms, trilobites are also a favorite among those familiar with paleontology. Journal of Vertebrate Paleontology (JVP) - Publishes original contributions on all aspects of the subject, including vertebrate origins, evolution, functional morphology, taxonomy, biostratigraphy, paleoecology, paleobiogeography, and paleoanthropology. Lucidcentral - How do you identify something (an organism, a soil, a disease) if you do not already know what it is? Generally, you need a key, a system built to help you identify an unknown item. Keys can be built to identify members of any group: the species of ants in Africa, the types of stars in our galaxy, the kinds of bacteria infecting a wound. Keys are built by experts to enable non-experts to identify their sample. Lucid software helps you in this process, providing a database and using Lucid Builder to list all of the characteristics you know to occur and matching them to their correct answer (which might be an identification of a plant or animal, a decision on a farming system, or a diagnosis of a complaint). Oceans of Kansas - A virtual journey more than 85 million years "back in time" to observe some of the many strange and wonderful creatures that lived in the oceans of the Earth during the final stages of the Age of Dinosaurs. Curator Mike Everhart, a paleontologist at the Sternberg Museum of Natural History in Hays, Kansas, uses photos of fossils and artists' reconstructions to bring alive the rera's toothed birds, snake-necked pleisaurs, hulking sharks, and long-snouted mosasaurs. Paleontological Institute of the Russian Academy of Science - The University of California Museum of Paleontology has set up a long-term cooperative agreement with the Paleontological Institute (Moscow), one which has resulted in several mutual visits, student exchanges and cooperative projects. This site presents an exhibit of photographs from the Institute's Museum of Paleontology. 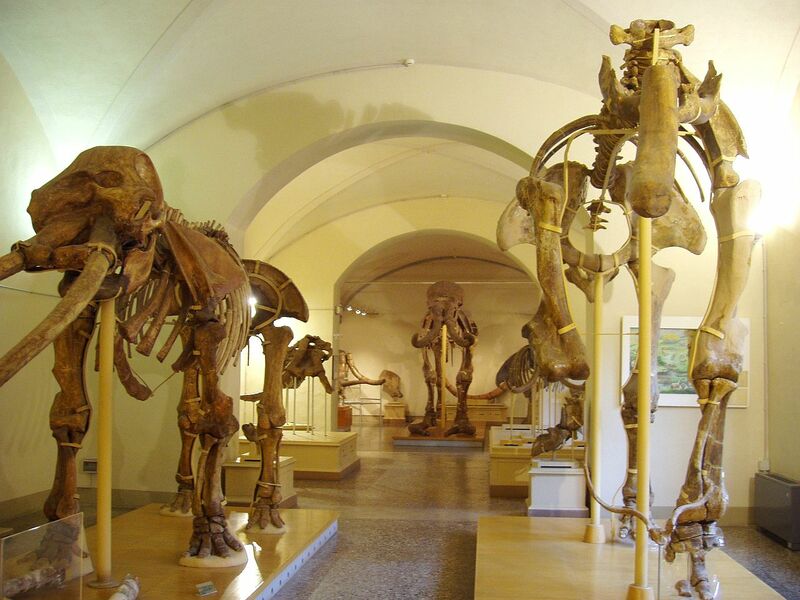 Topics include the architectural motifs of the institute, Mongolian dinosaurs, and Pleistocene and Tertiary mammals. Society of Paleontology (SVP) - 2,000 members representing professionals, students, artists, preparators, and others interested in vertebrate paleontology. Publishes the Journal of Vertebrate Paleontology. Sternberg Museum of Natural History - A department of Fort Hays State University. In addition to the exhibits, the museum houses significant scientific research collections. Two generations of Sternbergs collected some of the most spectacular fossils in the world. Their finds are in almost every major museum and played a dominant role in initiating the study of North American fossil vertebrates. After Sternberg's death in 1969, the museum was named inhonor of this family who gave so much to the science of paleontology. WWW Virtual Library: Paleoclimatology and Paleoceanography - Extensive paleoclimate links, including academic institutions, commercial sites, data archives, government institutions, museums, projects, publications, societies, and more. This webpage last updated on Wednesday, January 6, 2016 6:44 PM.